As part of Bradford White’s tall electric models classified as Energy Saver, the M250T6DS-1NCWW Electric Water Heater exemplifies the power of the Hydrojet® Total Performance System. This system includes a device in the cold water inlet that reduces the formation of sediment within the tank, and also increases the delivery of hot water during the first hour while lessening the temperature build up at the upper portion of the tank. This particular model supplies 50 gallons of water for a 3 to 4-member household. The unit comes with immersed double elements that directly and efficiently transfer heat to the water. The elements can be simultaneously heated or just one at a time. Dielectric fittings used for water connections (3/4” NPT) prolong the life of the heater and makes installation a breeze. To minimize the amount of heat loss, a 2-inch non-CFC foam insulation surrounds the sides and top of the tank. With this protection less energy is consumed; operation becomes more efficient; and jacket rigidity is improved. The addition of heat traps further minimizes heat loss in piping and removes the possibility of noise while in operation. The unit is backed with a 6-year limited warranty on tank and parts. The unit is one of the most efficient water heaters today with an energy factor of 0.90. The unit has a programmable timer that allows quick and automatic temperature control. It also has a sensitive energy cutoff for manual reset as an additional safety feature to avoid overheating. The tank is lined with Vitraglas® that shields it from the eroding effects of hot water and similar to some models in the market, the unit uses a magnesium anode rod to delay rust formation. While we have heard of owners complaining about poorly written manuals by other manufacturers, this one goes against the grain. The manual is well-written and easily understood. It appears that this unit isn’t as durable as the manufacturer claims. 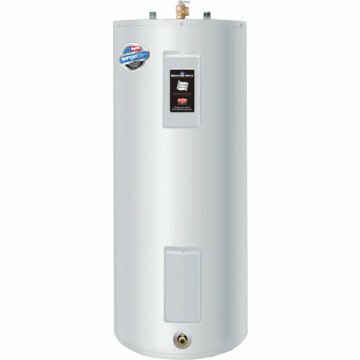 One owner replaced his Bradford White water heater every two years (with the same brand) because it either stopped working or leaked. Majority of those who have bought the Bradford White M250T6DS-1NCWW Electric Water Heater are satisfied with the performance of the unit. But, like in any other situations that require decision-making, do a lot of research and ensure that this particular unit is what you need. The question of durability cannot be taken as gospel because a major factor will be how regularly the owner does maintenance. If properly maintained, the unit will perform as expected.Be aware of the plumbing you use in your house. Most old houses have brass pipes which aren’t suitable for the unit’s inlet and outlet connections. Connecting different metals will cause erosion. Acquire the necessary hardware should this be the case.